I've always been a massive fan of rock music, and Paramore's Misery Business was one of my favourite songs from a very young age. There is something so empowering about Hayley Williams' voice and I never get tired of hearing it. She also has such cool style which I'll talk about a little later on. Paramore music is so upbeat but there is something quite electric about the way it makes you feel (if that makes any sense at all) and I absolutely love watching their music videos. The one below is my favourite and it's for the song Still Into You. It basically looks like a giant party filled with ballerinas, bikes, sparklers and a sea of balloons - all in this fancy house with pastel walls that match Hayley's jacket perfectly (so aesthetically pleasing). 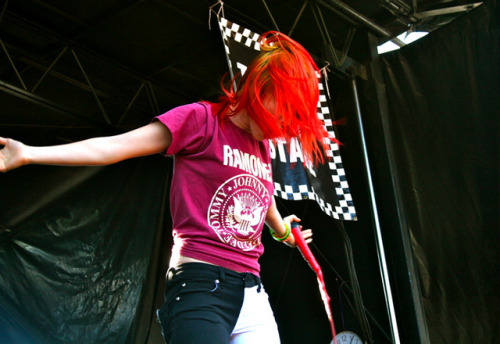 I love the way Hayley dances too as it looks natural and fun, not choreographed. They described it in this interview as trying to capture that magical feeling when you're still in love with someone visually. The song has such great energy and I think the music video captures it perfectly. Here are some pictures and gifs from the video because I am obsessed with Hayley's outfit. The tights and jacket are so rad. My other favourites by them at the moment are Part II and Ain't it Fun (which also has a great music video but I think that's enough for today). Are you a Paramore fan? HAYLEY IS SO PERFECT, and I adore paramore. I have been looking for tights like that forEVER and I'm just waiting for the day I find some. Also jacket, like you said. Also everything, her hair, her makeup ugh!!!! Wicked. I KNOW! Yes yes yes all is amazing. I've been a Paramore fan for the longest time! And Hayley is a-mazing. I love how she always seems to do and wear whatever the hell she wants. Love her! MY LIFE NEEDS TO BECOME THIS MUSIC VIDEO. she has such a quirky style, so cool!